During the following years Juslenius acted as the tutor to sons of various notables, such as David Lund, the bishop of Vaxjo in Sweden, and bishop and academic vice-chancellor Johannes Gezelius the younger. This certainly delayed the progress of his studies, but he was able to forge important personal relations with people of stature. Juslenius also worked as a sailor on board his brother Henrik’s merchant ship during the starvation years of 1696-7, until he was once again able to concentrate on his studies. Juslenius’ first actual scholarly essay was a preliminary thesis entitled Aboa vetus et nova (Old and New Turku), completed in 1700. He graduated as a Master of Philosophy with a dissertation (Vindiciae Fennorum, ‘The Defence of Finland’) which earned him the distinction of priimus, or best scholar in 1703. His teaching career in the Academy began in 1705 with work as an assistant in the Faculty of Philosophy. In the same year the first thesis to be written under his supervision was completed. Juslenius was appointed professor of sacred tongues, i.e. Hebrew and Greek in 1712. The following year however he was forced to flee the country, heading to Sweden with his family during the so-called Great Wrath. During his time in Sweden, Juslenius acted as the lector in rhetoric, i.e. Latin and poetry, at the Västerås school near Stockholm. He studied with growing interest theology, and was ordained as a minister to the parish of Västerås in 1720. It was not before the peace treaty of 1722 that he was able to return to Turku in southwest Finland to take up his professorial chair. Juslenius’ career path was made rocky by the demise of his mentor Johannes Gezelius the Younger at the time of the Great Wrath. The new chancellor, Herman Witte took a dim view of the appointment of a Finn to an academic post. 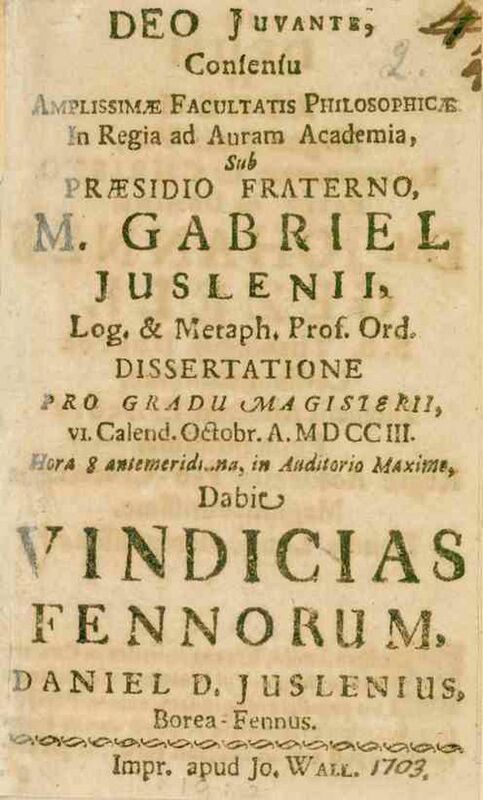 It was due to him that Juslenius was chosen for the more highly paid and more prestigious chair in theology in 1727. The Consistorium, or senate, had recommended Juslenius for the position some three years previous. Juslenius’ scholarly achievements over his seven years as professor remained modest, even though he was awarded the title of doctor of theology by the University of Uppsala in 1732. 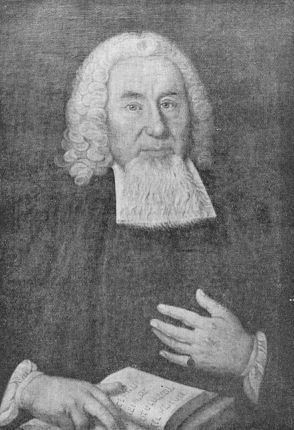 Juslenius was chosen to be Bishop of the diocese of Porvoo, east of Helsinki, in 1734. As bishop, Juslenius distinguished himself with several parish inspections as well as energetic proseltysing activity among Orthodox believers. With the outbreak of war in 1741, Juslenius again fled with his family to Sweden, but this time he was not to return to Finland. He was appointed bishop to the diocese of Skara, west of Stockholm in 1744. The following year Juslenius published his most significant work of scholarship, the lexicon Suomalaisen Sana-Lugun Coetus. His last work, a Finnish translation of Olaus (Olof) Svebelius’ ‘small catechism’, was published in 1745. It was still in use around the country in the second half of the nineteenth century. Juslenius also took part in the Diet as a representative of the clergy between 1731 and 1751. He died in Brunnsbro, near Skara in 1752. Daniel Juslenius has been described as one of the more influential and celebrated ecclesiastical figures of his time.